Can you distinguish this Color Classic from normal ones? Yes... This power indicatior is replaced from green LED to blue one. This LED is a tip type LED. Blue LED was developed in Japan few years ago and is still very expensive. Moreover, it is difficult to get blue LED's from any retail shops. It looks very COOL, doesn't it? Disassemble a Color Classic, and remove the front control panel. 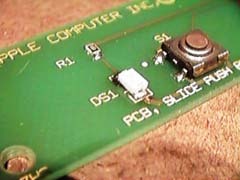 Remove an existing green LED at DS1 on the center of the board using a solder iron. Replace a new LED on the same location. Take care not to destroy the LED with the static electricity, since LED's are sensitive to it. A blue LED shows high illumination. Please try it.